All around the world, regions are struggling to reconcile growth with sustainable development. Inequality, unemployment and corruption are felt in every corner of society and need to be addressed in their specific regional context. To feel the irresistible force of the world’s fastest-growing economy first-hand, take a trip to People’s Square station in Shanghai during the morning rush hour. More than 400,000 people pass through this station every day, making it the busiest in China, as it serves a city that has grown by around 40% in the last decade. And Shanghai lags well behind Guangzhou, Beijing and Shenzhen in the growth stakes, the latter expanding almost 60% during the same period. Asian respondents to the Survey on the Global Agenda named inequality (14%) and the role of China (11%) as the issues they are most concerned about. Take a 20-minute drive from Xintiandi, Shanghai’s glitziest retail hub, to the sprawling shantytown made from shipping containers near its docks and you can’t help but be struck by these twin challenges. For Fu Jun, Professor of Political Economy at Peking University, and Vice-Chair of the Global Agenda Council on New Growth Models, the solution to sustainable Chinese growth hinges upon more domestic consumption, a more equal society and more efficient use of energy and resources. So, while a chastened US and Europe are having to tweak their economies in terms of overspending and over-reliance on the financial sector, China must work to redirect economic growth towards domestic consumption. Fu Jun says that this process will have to be finessed to involve the creation of better institutions to deal with monopolies of various kinds and to improve education, health and social issues, as well as the distribution of wealth. One region where economic reforms have pulled millions more people into the middle class – in part because of its freshly implemented $260 billion annual trade with China – is Latin America, an area bursting with commodities and energy. Brazil is now the world’s second-largest emerging market behind China and Latin American respondents to the Survey identified it as the country to focus on in their region. But they also picked out the many challenges facing Latin America, including inequality (30%), economic growth (14%) and education (13%). It’s an assessment that Enrique García, President of CAF Development Bank of Latin America and Chair of the Global Agenda Council on Latin America, would agree with. “Yes, exports have grown, macroeconomic policies have improved after the hyper-inflation and the ‘lost decade’, but now we need to look at the micro-economy. It’s time for a bigger investment in education, technology and infrastructure,” he says. García says that Latin America needs to undertake new structural reforms in order to improve further growth. “We cannot rely on primary goods exports. We have to move from a traditional advantage model to a competitive value model. We need a more diverse, more inclusive, economy,” he says. In García’s assessment, technology should make this possible throughout the region, but governments will still need to encourage innovation, creativity and entrepreneurialism. Tellingly, last year Brazil unveiled a BRL133 billion ($65.6 billion) stimulus package to spur investment in its creaking infrastructure, which was creating obstacles to faster growth. Few Brazilians believe this would have happened if the country were not hosting the World Cup next summer and the Olympic Games two years later. But García is taking the long view and says that supporting innovation and entrepreneurs and investing in education – encouraging financial institutions to ramp up small business activities – will help Latin America meet its other big challenge of turning its informal economy into a formal one. 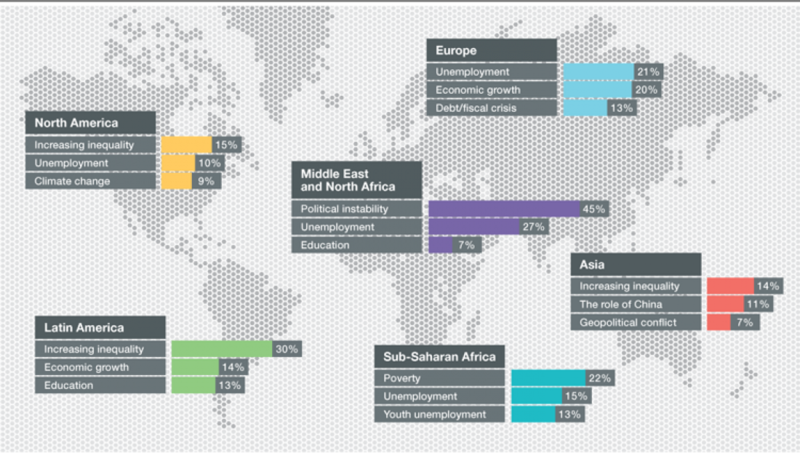 Survey respondents across the Middle East and North Africa cite unemployment (45%) and political instability (27%) as the biggest challenges facing the region, but El Dahshan says that despite sectarian issues, it is the economy that will ultimately lift the Middle East and North African countries. “People’s primary concern is when their next pay cheque will arrive,” he says. As in pockets of South America, the ‘informal’ sector of Middle East economies – where employees operate outside the provision and the protection of the state – is particularly significant. Across the Middle East, from street vendors to factories missing the correct licence, millions of people work in the shadows. Compounding the poverty cycle is the fact that many of these people live in unregistered dwellings and without proof of ownership – which presents further social and political challenges – and are not eligible for secured business or personal loans. El Dahshan refers to the research of economist Hernando de Soto, who estimated that Egypt alone has $248 billion worth of ‘informal’ property that it cannot use. “Interestingly, this issue has been successfully addressed in countries like Brazil by sending teams house by house to check for asset ownership, but this takes a lot of time,” he says. Inequality and corruption do not only affect emerging countries. “Inequality is a fundamental issue facing every country. There are inequalities within countries and between countries,” says Huguette Labelle, Chair of Transparency International and a Member of the Global Agenda Council on Responsible Mineral Resources Management. Labelle says that corruption prevents developing countries from reaping the benefits when they exploit their natural resources. “In 2006, for example, the Treasury Department of the Democratic Republic of Congo received only $86,000 despite around $1 billion worth of minerals being exported from the country. Around $2.5 billion of gold has been taken out of Tanzania but the government there has received only $28 million a year over an eight-and-a-half-year period.” She points out that there is 30–45% more chance of civil wars in countries with perceived corruption. Labelle says that the G20, its anti-corruption task forces and the World Economic Forum are pushing the envelope of the global discourse on transparency. As are the World Bank, regional banks and the UN Global Compact.